Microsoft's 'OneDrive for Business' is a store/sync/share feature of Office 365 and on-premise SharePoint Server 2013. While 'OneDrive' is intended for personal storage separate from the workplace, 'OneDrive for Business' is based on SharePoint and has more in common with Office 365 Team Sites. Udocx includes a 'Scan to OneDrive' app which is specific to OneDrive. Microsoft's 'OneDrive for Business' is supported through the Udocx 'Scan to SharePoint folder' app. 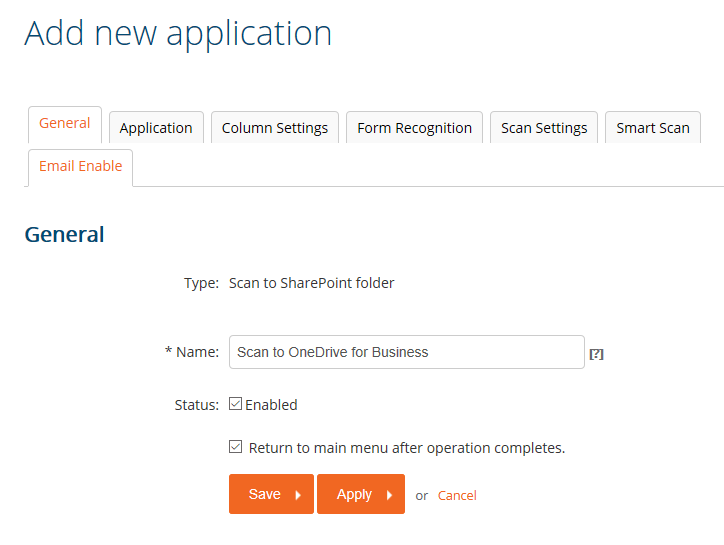 4.Select “Scan to SharePoint folder” and press [Next]. 5.In the “General” tab give the newly created App a name and make sure the “Status” is enabled. You may also choose whether to stay in the app or return the the main Udocx menu between operations. NOTE: The "Column Settings" tab is not available until the initial App configuration has been saved. 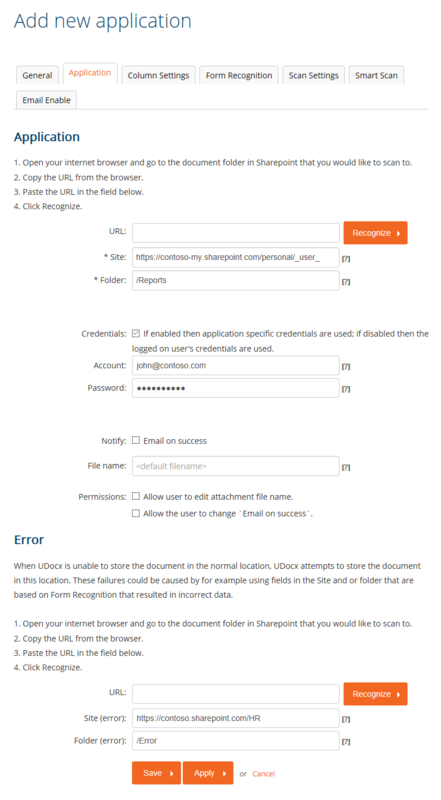 It is recommended to complete the basic configuration, save the App, then edit the App to import any columns as needed. 9. Click [Save] to confirm the App, which will take you back to the App overview. If you have custom SharePoint columns that you wish to configure, you may import them from the 'Column Settings' tab at this time. 10.If you wish to use Form Recognition, specify your template on the 'Form Recognition' tab. See the article on Form Recognition for details.